Amelia Holmes is the Librarian at the Schumacher Center. Under her care the Schumacher Center’s physical collections and online library cataloging system have been reorganized, making the content more easily accessible to students, researchers, educators, and activists. She is expanding the educational outreach programs of the Library to draw new attention to the resources there. Thinking about the future, Holmes is leading the campaign to renovate the 1,600 square foot ground floor level of the Schumacher Center Library, providing additional archival-grade bookshelves and storage area for the collections of papers from Fritz Schumacher and others. Holmes is overseeing the creation of a new website for the Schumacher Center, in the process recovering and revitalizing over 400 publications and newsletters, in order to provide viewers with more a comprehensive and visually appealing experience of the Center’s rich content and history. 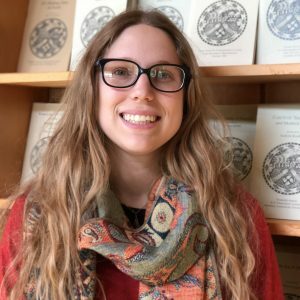 She also curates the Center’s social media accounts, highlighting the lectures and publications as well as content from partner new economy speakers and organizations. She assists editor Hildegarde Hannum with the transcribing and printing of past lectures into pamphlets and has made them available to read online and in eBook form on Kobo in Kindle. She graduated from Bennington College in 2011 with a BA in Environmental Science and Ceramics. While at Bennington she interned as an archivist at several organizations including the Metropolitan Museum of Art where she worked with the librarians at the Thomas J. Watson Library to organize and catalog books and periodicals in the Objects Conservation departmental library. Holmes is a voracious reader and young agrarian. She volunteers at nearby Indian Line Farm. She can be contacted at library@centerforneweconomics.org with questions about the Library, its collections, and the renovation funding Campaign.